At the end of World War 2 at treasure trove of advanced aeronautical technology was discovered in Nazi Germany, much of it relating to high speed jet-powered flight and critically, the use of swept wings on high speed aircraft. The knowledge was shared out between the victorious allies, the United States, Great Britain, France and the USSR. In some cases whole design teams from Germany were relocated to assist in developing the new technologies on both sides of the Iron Curtain that would divide Europe. In the new arms race a whole range of new, sometimes weird and wonderful projects emerged, designs t hat seemed to owe more to Buck Rogers or Flash Gordon than the previous World of propeller driven warplanes. No design team was more energetic or more vigorous than the Yakovlev Design Bureau in the Soviet Union. Having established its credentials in a progressively improved series of piston engine fighters in the Yak-1/3/7/9 series it embraced the jet age with innovation and enthusiasm. 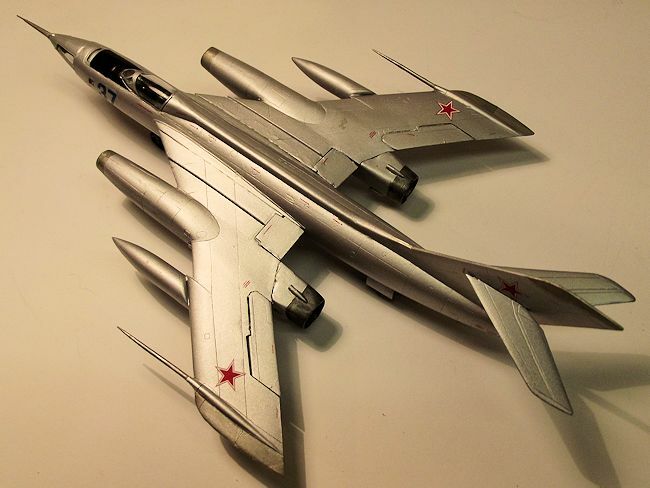 Its first efforts were minimally adapted versions of its piston engine tail dragger fighters, with a jet engine grafted under the lower part of the forward nose, progressively adapted further with a tricycle undercarriage and more powerful engines. It is this pattern of incremental design improvements that led to a remarkable series of versatile twin jet aircraft that would rival the likes of the Ju-88 or Mosquito of World War 2, or the B-57/Canberra for versatility. The USSR issued a requirement for a two seat radar equipped interceptor that would emerge as the Yak-25, which first flew in June 1952. In the words of Bill Gunston and Yefim Gordon it “led to a prolific and important family of derivative aircraft” that transformed an initial subsonic design weighing less than nine tonnes to a supersonic aircraft weighing twice as much. Through the process of never making too many changes simultaneously , the -25 evolved into a tactical bomber, a tactical and strategic reconnaissance type and even an early form of unmanned drone. Via the -26 and -27 the family line was developed and refined with progressively more powerful engines. 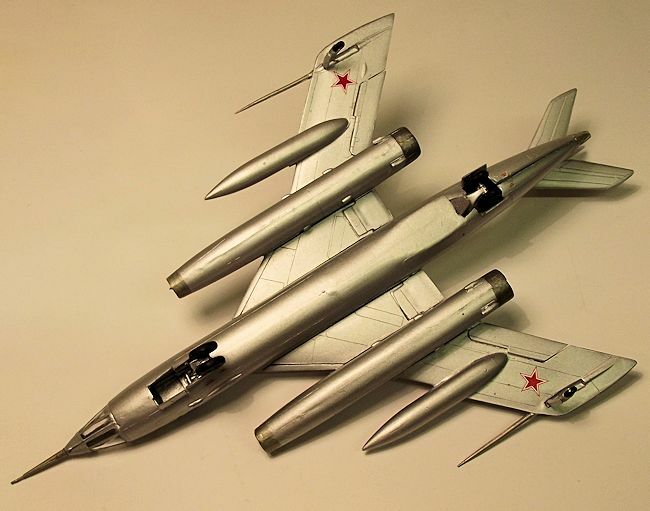 What remained constant was the basic configuration: a sharply swept shoulder mounted wing, each carrying a single podded turbojet, the long slender fuselage and the distinctive bicycle-type landing gear with wing tip outriggers. The Yak 28 emerged from a ministerial decree of March 1958 for a supersonic bomber, and the -28L first flew in early 1961. Although it was a wholly different aircraft from the original – 25, its family resemblance was unmistakable. It was configured for tactical nuclear strike and featured a navigator’s station in a distinctively glazed nose. It was powered by two R-11AF2-300 engines of over 13,000lb thrust with afterburner. It was easily supersonic and a formidable attack bomber. 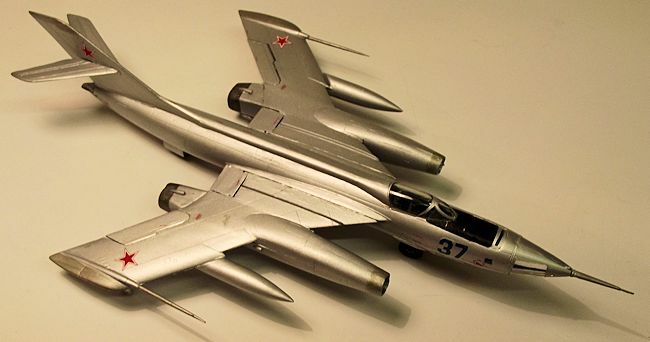 The Yak 28L entered production in January 1962 and a total of 111 were manufactured. Its NATO reporting name was “Brewer-B”. The -28L had an all up weight of around 34,000lb and was capable of Mach 1.8 at over 25,000ft with a range of 1500 miles. Over 1,000 aircraft of all these Yak variants were built, the last lingering on in test and evaluation roles until the early 1990s. The project comes in a small, rather flimsy, tray-type box with a water colour illustration of one aircraft on the lid. The box is crammed with a stack of nine small parts frames in a rather greasy pale grey plastic. First impressions are of flash-choked parts with vague and irregular edges. The parts breakdown is comprehensive and ambitious but the short run medium means that many of the smaller parts are rather crude and ill-defined. Surface detail consists of recessed panel lines of variable and inconsistent depth. This is an all plastic project, no resin, etch or film is to be found here. The instructions are six pages of cheap grey-scale newsprint. There are twelve stages of construction set out in pictogram style and a chart with reference to each parts frame and the parts themselves clearly numbered. One neat idea that could be adopted by other manufacturers is that each assembly stage also list the parts required, by number, at the top of the pictogram. The smallish decal sheet provides six red stars and a choice of two bort numbers “Red 06” and “Blue 37” for otherwise anonymous silver finished aircraft. Tiny red airframe stencils are also provided. From first impressions, I anticipated that this would be a long haul build. Each and every part had to be cut from the frame, trimmed, sanded and fettled to ensure that it would fit. This is everything that you hear about a short run kit, and then some. Having examined the parts at some length I decided that, although some of the finer detail is decidedly clunky, I would use all of the components supplied. The internal sub assemblies were jiggled, fettled, trimmed, sanded and juggled into position then the fuselage halves were joined. The fit of most parts was challenging to say the least and I found that the best result was to use a jointing technique that goes way back to the early 1960s. Kits of that era, and to my best recollection especially Monogram, recommended that if parts did not fit too well then a liberal amount of tube cement should be applied to the joining faces and left to soften the plastic before the parts are joined together. So squeezed together and heavily taped, the halves were joined and left overnight to dry. No nose weight is needed since the airframe is supported by the rearmost main undercarriage unit. At the same time I gathered up all the parts that I could find that similarly needed to be paired up such as the wing tanks and engine shock cones and gave them the same treatment. The wing halves consist of a one-piece main unit forming the upper surface from root to tip with part of the upper engine nacelles and I was impressed with the fact that this complex component was free from major distortion, although there were a few minor sink marks of the upper surface. Separate wing flaps and ailerons are provided and a small infill panel completes the under surface between the nacelle and wing. The fit of parts was, at best, variable. The engine nacelles were next, formed as left and right halves that trap a centre body shock cone and a representation of a turbine wheel. One again the halves were joined by well soaked tube cement. I returned to the fuselage and glued in the weapons bay doors and the upper fuselage hatch for the bombardier. The fit of these parts was atrocious so they were levelled off as best I could and left to dry overnight. Next the wing assemblies were joined onto shallow stubs on the fuselage sides. I got the impression that the slots and tabs on the respective parts must have been raised by different tribes because they had little in common. In the end I reduced the tabs to a minimum to assist in lining up the joints. The fit was so sloppy that the wings and fuselage had to be jigged up with clothes pegs and paint tins until the joint had hardened, again after an overnight wait. The horizontal tails were also fixed at this time. When all dry the whole airframe was rubbed down with coarse and medium sanding sticks and then filler was slathered everywhere. Green putty to just about every joint line on every surface. This was rubbed down and the airframe coated with grey auto primer from a rattle can to check for any imperfections, which were many, so further dings and scratches were filled with white Revell Plasto, which I find useful since it softer and more runny in application than Green Putty. Again primed and rubbed back the airframe was acquiring a coat of many colours, grey plastic streaked with green and white filler. The nose and canopy transparencies were trimmed and fitted, and masked with Tamiya tape. The three very prominent probes to the nose and wingtips were fitted at this stage so that the joints could be blended in before painting. This makes the airframe awkward to handle at the finishing stage, but I could not find a better option. Now at last it was time for painting. A coat of that long suffering (and fast dwindling) auto primer, followed by a finish of Tamiya XF-16 acrylic Aluminium Silver with the small anti-glare panel over the nose picked out in XF-1 Matt Black. Paint was applied with my ever-reliable Iwata HP-C airbrush, thinned about 80:20 with Tamiya acrylic thinners. The wing and fin tips, the engine intakes and exhaust areas were picked out in X-32 Titanium Silver and XF-32 Metallic Grey for contrast. When dry a brushed on coat of Future/Klear provided a base for the decals. The decals went on fairly easily. They are thin and potentially fragile but settled down without the need for setting solutions. The instructions consist of a 3-view drawing showing the top and underside of each subject but only a left side view of the fuselage. Since there are 55 small stencils in red lettering, this proved to be a minor problem in decorating the right side of the fuselage, so where a numbered pair was provided on the sheet I assumed a mirror arrangement for the right side. The undercarriage assemblies were a challenge since the legs had a heavy seam line along their length and needed careful cleaning up. Each of the main gear assemblies, front and rear, were in three parts and the vague joining surfaces made life more difficult. However the instruction sheet includes full size side view sketches of the assemblies which show the relationship of the main legs to the support struts. These were built up, set into the front and rear gear bays and once again left overnight before the gear doors were added. The wing tip outrigger assemblies were added last. The final touch was filling the tiny fuselage windows with Kristal Kleer. This one of those kits that fought me at every turn, it was not so much finished as having reached the stage that I could do no more with it. This is certainly a “three footer” in my collection, the result of a challenging kit and a test of my limited skills. It is a project that dragged on for weeks, in part because so many overnight drying sessions were required and the amount of time that I spent in rubbing down and refinishing. For those who want finer detail or a competition-standard model there is much work to do in refining parts such as gear and weapons bay doors and rescribing surface detail. For all that, I like it. 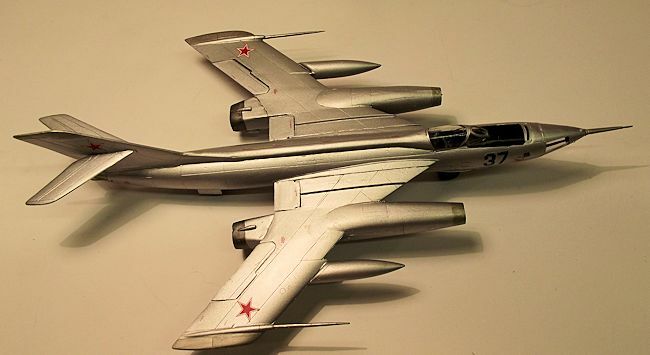 A-Model produces the Yak-28 as one of their many subjects that are not available anywhere else, so it is worth the effort. It may have left me yearning for a crisp Tamiya kit that starts to assemble itself as soon as the box lid is lifted, but it is satisfying to have fought it to the finishing line and it is like nothing else that has ever appeared in my collection. The price is reasonable, too. Recommended to fans of the weird and wonderful. Yakovlev Aircraft Since 1924, by Bill Gunston and Yefim Gordon. Putnam & Co, 1997.